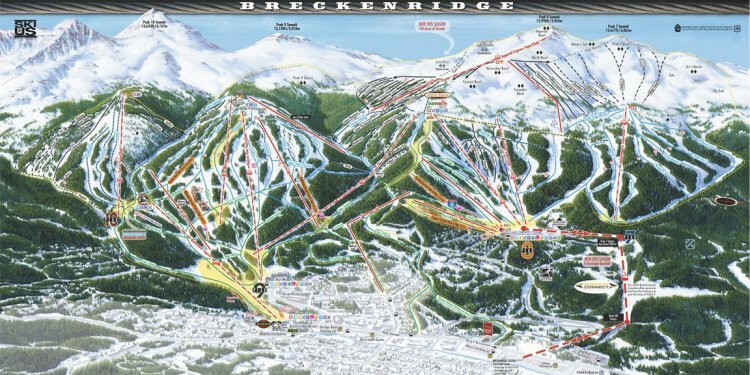 Where is Breckenridge Ski Resort? There’s lots of great terrain here for intermediates and families. It’s literally everywhere and of every type: groomers, wide glades, tame bumps and little shots off in the woods that kids love. Getting around this place can take some planning as skiers funnel to two separate base areas that aren’t easily skied between without hooking up with a lift or two. For most people arriving by car or even bus, a meandering Gondola awaits to relocate skiers from a parking lot to the base area of Peak 8. From there, skiers can hop a number of high-speed lifts toward other parts of the mountain. The other large base area, Peak 9, sits closer to the center of town and includes a large portion of the resort’s on-hill lodging. Parking at this part of the mountain is limited, but if you’re staying in town it’s easy to access things here by bus. Breckenridge is actually comprised of what it refers to as five different “Peaks, ” from Peak 6 to Peak 10. The peaks themselves are quite high for North America, with Peak 10’s summit at 13, 639 feet. The highest lift-serviced terrain in the United States lives at Breckenridge at the zenith of the Imperial Express Chair, which dumps skiers off at 12, 840 feet. Intrepid types can hike to in-bounds terrain that is higher than 13, 000 feet. While the altitudes are impressive, the steep terrain at Breckenridge is limited to small shots toward the very top of the mountain. But because it’s so high, the snow tends to keep its cold composition well after a snow cycle. We have a reliably dependable source that tells us Breckenridge is the most-skied resort in the United States. That is, it sees more skier days than any other mountain. There are a lot of reasons for this, but one of them is that Breckenridge, the town, is the most legitimate “town” that directly abuts a ski resort in the popular central Colorado region that straddles I-70. This only includes areas east of Aspen, of course; Aspen, one very influential ski magazine editor told me, is, when it comes to ski towns “the promised land.” And that may very well be true, if you like your promised land awash in fur coats. Note to Aspen people: lots of good in your town, we know it and we like it, but we jab when necessary. So it’s true that Breck is the best ski resort town off of the I-70 corridor before you get to Aspen. The reasons for that can mostly be traced to the fact that, unlike Vail, Beaver Creek, Copper Mountain or Winter Park—all fine places in their own way—Breckenridge was a proper town before skiing became a thing. So Breck has that classic main street in the way Park City or Aspen or Telluride have main streets (granted, not all mountain town main streets are created equal, but you know the aesthetic of which we speak).